NEW YORK, NY, USA, July 11, 2018 /EINPresswire.com/ -- Goliath Resources Limited (TSX-V: GOT) (Frankfurt: B4IE) announced the initiation of its surface exploration programs on both its Copperhead and Lucky Strike properties located proximal to the Golden Triangle in British Columbia. The Company is planning to drill highly prospective virgin targets this 2018 which were previously under glaciers that only recently retreated, exposing exceptional Gold, Silver, and Copper mineralization at surface. Goliath Resources Founder and CEO, Roger Rosmus, was interviewed recently by Dr. Allen Alper, PhD Economic Geology and Petrology, Columbia University, NYC (we have provided excerpt copy of interview below). Goliath Resources has recently been the subject of several advisories, including mining analyst Bob Moriarty and Portfolio Manager John Newell of Fieldhouse Capital Management, regarding exceptional valuation-creation potential as the Company prepares to drill two of its four properties this summer-2018 proximal to the Golden Triangle in British Columbia. A very real possibility exists for investors to experience a major appreciation in share price when Goliath announces initial drill results. Analogies for what GOT.V investors have potential to see are what happened to the share prices of GT Gold Corp. (TSX-V: GTT $0.20 to $2.76) and Garibaldi Resources Corp. (TSX-V: GGI $0.20 to $2.76) when they hit their discovery drill holes in 2017. Dr. Allen Alper: This is Dr. Allen Alper, Editor-in-Chief of Metals News, interviewing Roger Rosmus, the Founder and CEO of Goliath Resources. Could you give our readers/investors an overview of yourself, your company, your focus and current activities? Roger Rosmus: I've been in the investment banking world for over 25 years, primarily raising capital for private and public companies, many have been in the resource sector. When I saw this package of assets, I literally fell off my chair, in awe, because this is a once in a life time opportunity. I've never seen anything so spectacular as these four projects in my entire career that also have similarities to GT Gold Corp. (TSX-V: GTT) and Garibaldi Resources Corp. (TSX-V: GGI) projects before they drilled. After the company was incorporated, we raised 2.2 million dollars and completed a RTO transaction in October of 2017. We are currently trading on the TSX venture, under the symbol GOT, and more recently, we listed on a Frankfurt, the ticker being B4IE. With the 2.2 million raised, we took options on four projects in the golden triangle and surrounding area from the J2 Syndicate, a private company and precious metals project generator. 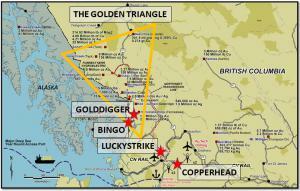 Golddigger and Bingo projects are within the triangle, and we have two projects, just south of there, around Terrace & Smithers, BC, which are Lucky Strike and Copperhead. In addition to taking the four property options, we also acquired a 10 percent interest in a private syndicate called DSM, which staked six projects far south of Terrace. Goliath will receive 10 percent of all the economics in relation to any deals on these projects, that could potential provide non-dilutive cash flow for the company down the road. The full CEO interview may be viewed at http://sectornewswire.com/release070618got.htm online. Articles, excerpts, commentary and reviews herein are for information purposes and are not solicitations to buy or sell any of the securities mentioned.